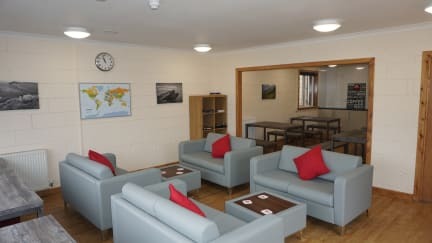 Located in the heart of Portree, capital of the Isle of Skye, and one of Scotland’s most popular destinations, Portree Youth Hostel offers a range of room types, from small private en-suites to shared accommodation, some with views over the Sound of Rassay. All rooms have USB charging points and most have individual bed lights. Guests can opt for continental breakfast served in the dining room or make use of our well-equipped self-catering kitchen. WiFi is free for all guests and there’s a small, cosy lounge, laundry and drying room. 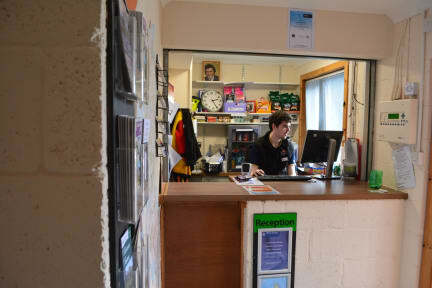 Basic provisions, confectionery and soft drinks are available to purchase at reception. Packed lunches are available for groups of 20 and over. There’s free public parking opposite the hostel, subject to availability. Surrounded by hills, Portree sits in a natural harbour, busy with fishing boats, pleasure craft and sightseeing cruises. The main town on the Isle of Skye, Portree offers a wide range of shops, galleries, sightseeing boat trips and fine restaurants serving delicious locally sourced food and drink. The hostel has excellent public transport links and is only a short walk from the nearest bus stop. From here, local buses can help you explore the whole north side of the island with its wonderful scenery. Staff is super nice, some beds are creaky but very comfortable. Great location and everyone talks to each other so it's perfect for making friends. Would only stay here upon return to the Isle. This was a FANTASTIC hostel! The best one I’ve stayed in. Super clean, really nice facilities, good location, great atmosphere! Excellent hostel. Facilities were amazing and clean, the shower was wonderful, and we were in a smaller room than expected. The staff were super friendly and helpful, and the location is perfect. Facilities were excellent as was the view from the lounge. Bathroom sink was way too small though. We had a lovely double room with TV and en-suite, great price. Perfect location in the centre of town, all restaurants within easy walking distance. Also perfect starting point to explore the highlights of Skye. Kitchen was really well-equipped for self-catering. Great location in portree, in the centre of town close to eveything including the bus station. The hostel was great. & general cleanliness great..the problem was with the beds. when I went up to my dorm & choosing a bed i found the mattress protectors were filthy & stained, & very badly stained the pillows were ripped & stained. I told the staff & they did change the mattress protectors, but really it was quite shocking. The rest of the cleanliness in the hostel was totally fine. The hostel location is great, right in the centre of Portree. However there was no atmosphere whatsoever when we there, even though it was fully booked no one was interacting with each other, weird! BE CAREFUL IF BOOKING THROUGH HOSTELWORLD!! We booked a twin room only to find that it was already booked so had to pay for a quad room if we wanted to stay for an extra £60! Top tip though, just round the corner is a great little Chinese takeaway! Our room flooded. The staff member there made it seem like this had happened before. We tried to move rooms but they were full so we ended up leaving and getting a hotel room unfortunately. Other smaller problems with the hostel: the whole place smelled like paint, the lights in the beds didn’t work, there were holes in the walls as if they were part way through construction, the printer couldn’t print my reciept for my payment for me to sign. But the biggest problem - OUR ROOM FLOODED.